Engagement traditions have changed dramatically over time. Strict engagement etiquette of yesteryear has relaxed and today, even the most traditional engagements offer plenty of opportunity for the bride and groom to demonstrate their unique personality. Traditions that surround an engagement and marriage have a history that stretches back over several centuries. Engagement traditions of today are a blend of traditions from the past and from different cultures, which have been made relevant to contemporary life. Man asks permission: Traditionally the man speaks to the parents of the bride-to-be and asks for permission to propose marriage to the bride. Man proposes without permission: The tradition of asking for permission from the parents to marry has relaxed over the years, and it is widely accepted that the man proposes to his loved one without first asking permission of the parents. Woman proposes to the man: Another much loved tradition is that girls can propose to their boyfriends on the 29th of February which occurs every leap year. Man popping the question on bended knee: The method of proposal is flexible, and the tradition of a man getting down on bended knee to propose is becoming less common with more unusual and innovative proposals growing in popularity. One of the most well known engagement traditions is the wearing of an engagement ring. While popularity of diamond rings is a relatively recent tradition, rings have been given to mark a betrothal throughout history. 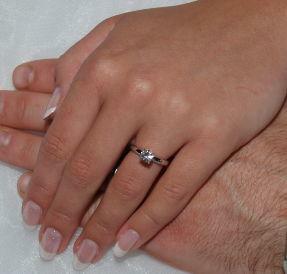 Very traditional styles of engagement rings include solitaires. Fashions and trends help dictate popular styles of the time, however many brides-to-be still opt for traditional and classic styles. One engagement tradition was for the man to buy an engagement ring for his partner as a surprise. While this is still a popular tradition, many couples now choose the engagement ring together. When choosing an engagement ring it is also important to consider the wedding ring and how it will look combined with the engagement ring. Very traditional styled engagement rings look best paired with traditional styles of wedding rings. The tradition of holding a party to celebrate an engagement with family and friends is one that remains popular today. The party is a way for the newly engaged couple to share their news and celebrate with their loved ones. Traditionally the party would be given by the parents of the bride, however today the party is as likely to be hosted by close friends as it is by family members. Engagement parties can be low key affairs, perhaps a dinner party with just the parents of the couple but a large flamboyant party is also common. The type of party a couple chooses will depend on their personalities as well as budget and the location of family and friends. Another important tradition is the sharing of the news of an engagement via an engagement announcement. The announcement of an engagement would have originally been placed in a newspaper and a letter sent to close family and friends. Today there is a much greater degree of flexibility and many more options available. A newly engaged couple can announce their engagement via email, online or in many other ways. As engagement traditions have evolved over the years, so has the opportunity for couples to create their own special engagement by combining new and old traditions. Think about what is meaningful to you and your partner, and try to incorporate it into this special time in your lives.